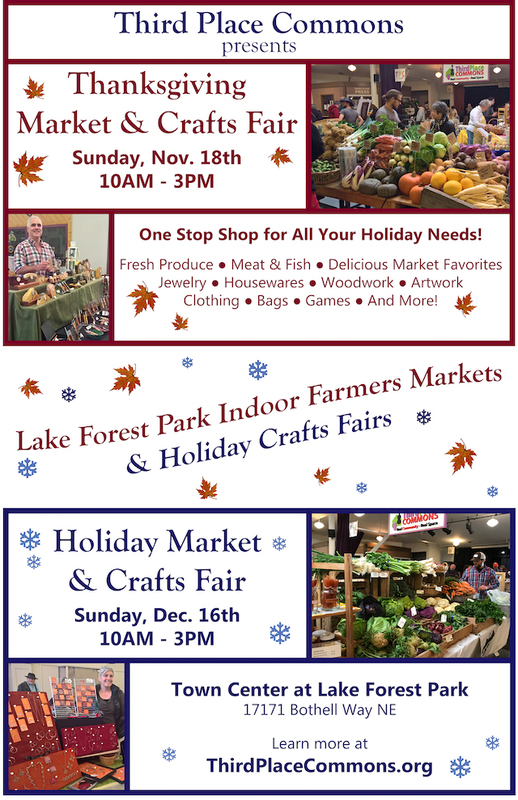 This Sunday, November 18, 2018 is the perfect time to start preparing for your Thanksgiving feast and to get a jumpstart on your holiday shopping thanks to the return of the Lake Forest Park Farmers Market and Holiday Crafts Fair! Start making your Thanksgiving dinner shopping list now so that you’re ready to receive the full bounty of the LFP Farmers Market this Sunday from 10am to 3pm. Pick-up all the freshest and best in Washington grown and produced fruits, vegetables, meats, fish, wines, baked goods, and more. Find all your favorite seasonal produce to make your holiday feasts extra special. Farm-fresh offerings – including apples, artichokes, arugula, beets, broccoli, Brussels sprouts, garlic, pears, potatoes, pumpkins, sweet potatoes, winter squash, zucchini, and so much more – will help you top your table in delicious style. SNAP benefits will once again be matched dollar for dollar (in even increments) with Fresh Bucks for fresh fruits and vegetables. And you can still spend your 2018 Market Bucks at the market, too, through the last market on Dec. 16th! Then head downstairs to beat the Black Friday crush at the Third Place Commons Holiday Crafts Fair featuring the unique creations of over 30 gifted Washington artists and artisans. You’ll be dazzled by a beautiful array of handcrafted works and sure to find the perfect gifts for everyone on your list (including yourself). Offerings will include handcrafted jewelry, pens, woodwork, home décor, toys, clothing, and holiday novelties. From fine arts to fabric arts to potions, lotions, and notions, the Holiday Crafts Fair will truly have something for everyone! Both events take place at the Town Center of Lake Forest Park. The LFP Fall Farmers Market will be upstairs at Third Place Commons, while you will find the Holiday Crafts Fair in the lower lobby. Both will be open from 10am to 3pm. And don’t forget to mark your calendars for the final fall market and holiday crafts fair on Sunday, December 16th (details to come). The LFP Farmers Market and Holiday Craft Fairs are presented by Third Place Commons, a community-supported 501(c)3 nonprofit organization dedicated to fostering real community in real space. Third Place Commons is located in the Town Center at Lake Forest Park at 17171 Bothell Way NE, Lake Forest Park 98155.